A candlelit accessory and a conversation starter, all in one! 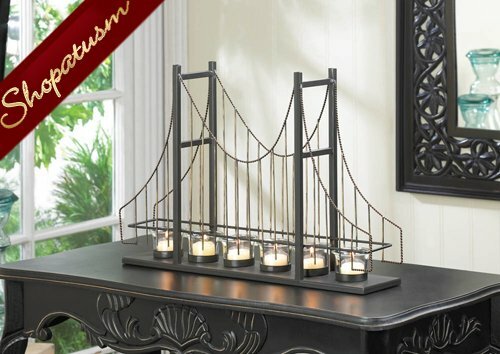 This charming candle holder features six fluted clear glass candle cups set on the framework of a suspension bridge. Metal posts, golden wires, and beaded details make this a lighting accent that is your room's bridge to style! Item weight: 3.6 lbs. 19 1/4 inch x 4 inch x 13 inch high. Iron and glass. Candles not included.